Here’s an amazing frozen dessert recipe to satisfy your sweet tooth this summer! 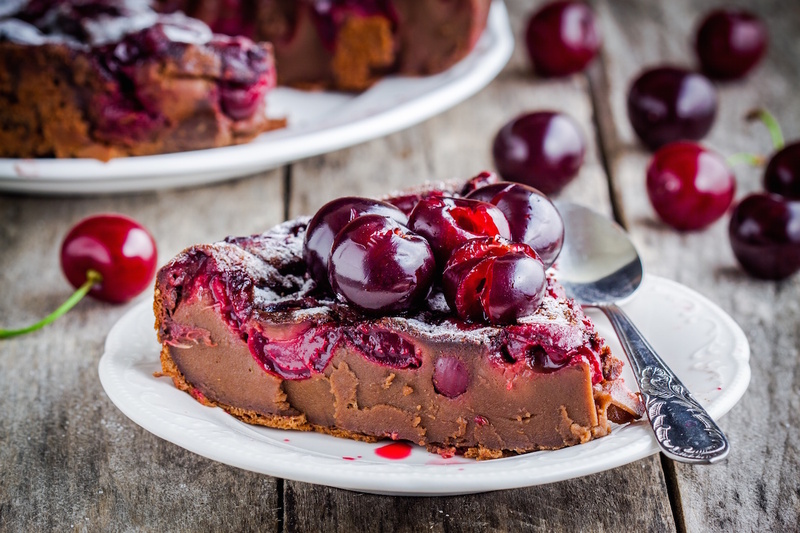 Here in Montana, we are known for our cherries and this is a great way to incorporate them into a meal or use up any extras. I love adding fruit to dessert to add natural sweetness without all the added sugar. Note that maple syrup is pretty sweet and you may be able to use up to 1/2 the amount of maple syrup this recipe calls for. You could always start with half the amount and adjust it to your own taste. However, I have not tried this, so don’t hold me to it! 1. Line an 8-inch round cake pan or springform pan with parchment paper. 2. Prepare the base layer by combining all ingredients in a food processor or high powered blender, until the mixture sticks together. 3. Scrape out the base layer and spread it evenly in the prepared cake pan. Put the pan in the freezer to chill. 4. Meanwhile, prepare the middle layer of the cake. Drain the cashews from the water they were soaking in and blend in a blender/food processor until they form a creamy consistency. Add in the rest of the middle layer ingredients and blend until smooth and all ingredients are incorporated. 5. Remove the cake pan from the freezer and spread the middle layer over the base layer. Return to the freezer and allow to chill for 2 hours, until firm. 6. Prepare the cherry topping by blending the cherries and vanilla extract. Blend until smooth or leave some cherry chunks if you prefer. 7. Add the cherry topping to the top of the cake and spread evenly. Sprinkle the cacao nibs on top and return the cake to the freezer until firm. 8. Remove from the freezer and allow to sit for 15 minutes before serving. Note: It may be easier to slice with a hot knife. You can also melt additional cocao nibs and drizzle on top!